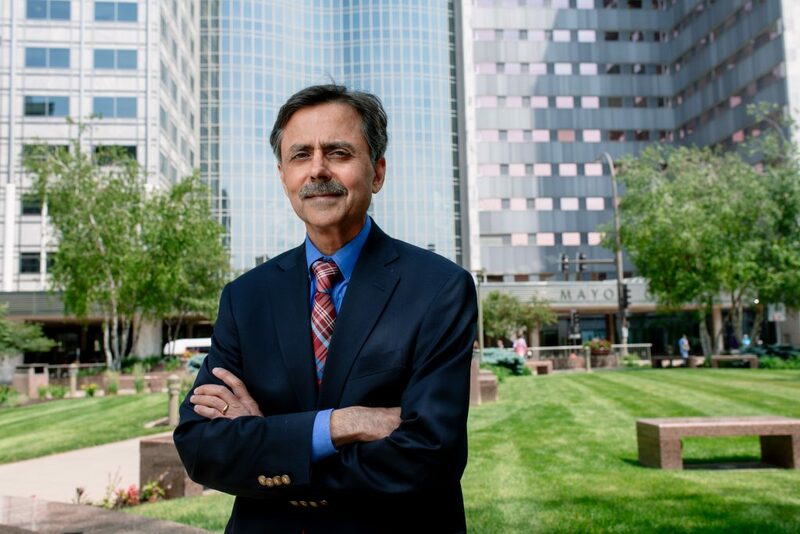 Sundeep Khosla, MD, talks to Endocrine News about his ENDO 2019 plenary talk on treating osteoporosis via cellular senescence with the ultimate goal of making the golden years truly golden with a better quality of life. ENDO 2019 is now about 10 weeks away, and while we’re excited about all the sights, sounds, and smells of New Orleans, we’re just as excited about the sessions and all the breakthroughs in the field of endocrinology. Endocrine News caught up with Khosla to discuss his forthcoming plenary and what his work could mean for the future of healthcare. Endocrine News: First off, since this is a preview of your plenary talk, can you share any of the highlights or details of the talk? Sundeep Khosla: Basically, I’m going to start off just by providing a brief background on how much progress has been made in terms of drugs to treat osteoporosis. But despite that progress, because of concerns about rare side effects related to existing osteoporosis drugs, there are many, many patients who are at risk of fracture but are, in fact, not getting treated. There’s a strong argument for thinking about new approaches to prevent and treat osteoporosis. That’s when I was attracted to this idea with these diseases related to aging, such as heart disease, diabetes, osteoporosis. The historical approach is to treat each of the diseases separately — so you take a statin and a blood pressure medicine for cardiovascular risk. You take a different drug for diabetes. That leads to problems with patients as they get older being on many different drugs which causes adverse drug interactions, non-compliance, and so forth. The concept that we and others are trying to put forward is that you have this constellation of diseases associated with aging like osteoporosis, dementia, diabetes, so forth. But they share the same risk factor, which is aging. So is it possible, instead of targeting each disease separately, can we in fact target a common aging mechanism to maybe try to treat multiple aging diseases? That’s really where the geroscience hypothesis has come about — that we could manipulate fundamental aging mechanisms that will delay the appearance or severity of multiple chronic diseases. Then I’ll move right into our work on osteoporosis and the identification of senescent cells in the bone microenvironment. How, when we target these cells, we can prevent bone loss in aged mice. And that we see a similar increase in senescent cells in humans with aging in the bone microenvironment, so arguing that this isn’t a phenomenon limited to mice. EN: We featured some of your work earlier this year in a Trend, on how targeting cellular senescence could halt age-related bone loss. Will this talk be a continuation of that work? Have there been any developments since then that you’d like to share? SK: Yes – additional data beyond what you featured including: (1) that estrogen deficiency likely does not involve increases in cellular senescence, which is more characteristic of aging – this has implications for the FDA approval of “senolytics” (which kill senescent cells) for osteoporosis; (2) additional data in collaboration with my colleague, Jim Kirkland, showing that reducing senescent cell burden ameliorates age-related frailty and extends lifespan in mice. The two main causes of osteoporosis in humans are menopause, which causes estrogen deficiency, and aging. So, we have extensive data showing that with aging, you get cell senescence and other aging mechanisms. But, with estrogen deficiency we actually don’t see an increase in cell senescent markers in bone. That’s relevant to the FDA, so if we have new drugs that kill senescent cells, for the FDA, the standard animal model is a gonadectomy-induced bone loss model. These drugs won’t work in the acute gonadectomy setting, but they’ll work in the aging setting. So, there’s implications for these drugs — as they’re applied to humans — as they go for FDA approval. We have some more recent data and collaboration with Dr. Kirkland on the role of cell senescence in frailty models with aging. And, how targeting senescent cells not only prevents frailty with aging in the mice, but also actually extends their life-span. In terms of thinking about fracture, that’s a function of the low bone density as well as frailty and falls. So, potentially, these drugs could address both aspects and thereby prevent fractures from occurring with aging. Then I’m just going talk a little bit about clinical trials that we have ongoing. They’re early stage, “proof-of concept” clinical trials. We also have to consider the potential downsides of killing senescent cells. Such as, in a wound repair, or potentially consequences for cancer development. EN: In that JCEM article, you wrote that “the number of women who will experience a fracture in one year exceeds the combined number of women who will experience incident breast cancer, myocardial infarction, or stroke.” That seems like a staggering number. And that’s compounded by this declining interest among pharmaceutical companies in developing osteoporosis drugs. That seems like a kind of perfect storm of why this sort of novel research is needed now. SK: There are several reasons why pharmaceutical interest has declined. One, is that the FDA has required demonstrating a robust fracture risk reduction for approval. The drug companies have been competing with each other to show a reduction in hip fracture rates or non-vertebral fracture rates. That requires very large studies of the order of 10,000 to 15,000 subjects. They’re very, very expensive. And unlike a diabetes drug, for example, where basically you have to show a reduction in the hemoglobin and A1C, or a blood pressure drug, where you have to show a reduction in blood pressure, for osteoporosis, the numbers that you need to show fracture reduction are huge. There are a number of us that are working with the FDA to see if drugs can be fast-tracked based on using bone density as a surrogate marker, rather than requiring a fracture end point. That’s still in discussion with the FDA. The osteoporosis trials are really very expensive. I think the other part of it has been that because of patients not wanting to take the existing drugs due to potential side-effects, the drug companies are concerned that some of this reluctance may spill over into some of these other drugs. So they’ve kind of shifted their focus more into frailty, muscle, or diabetes, rather than on the bone area. I think this was also compounded by the fact that Merck had a new drug called odanacatib, for which they spent $1 to $1.5 billion on for a trial. And it worked really well for bone, but because of an increase in stroke events, which was modest, there was a clear signal to pull the plug on the drug. That was a huge negative in terms of osteoporosis drugs. There’s a number of things that have been happening in terms of major clinical trials failing, the size of the trials that are required for fracture, and then collectively that’s caused the pharma companies to move into other areas and kind of leave osteoporosis behind for now. EN: Your work seems like an answer to that. Is that fair to say? SK: What we hope is that instead of just focusing on osteoporosis, if we put osteoporosis in the context of these aging diseases, maybe we can attract pharma back, because then osteoporosis is just one of multiple other diseases as opposed to the only disease that they’re working on. EN: Right. You talk about wanting to focus on aging itself. SK: We’re not even focusing that much on lifespan; we are really focusing on health-span. We’re all going to get old, but can we maintain a more productive life for our lifetime, however long that is? Our goal is that whatever time we have, we spend it in the best possible health and productively, so we’re not in a nursing home, and have a better quality of life. I think that’s the more modest, achievable goal. As opposed to making people live longer, which has its own set of problems because eventually everybody gets debilitated. EN: In the “Hallmarks of Aging” (Lopez-Otin, et al.) you pointed me to, it talks about the primary purpose of senescence as preventing the proliferation of damaged cells, but aged organisms have a harder time accomplishing this, leading to an accumulation of senescent cells. SK: That’s the issue with cell senescence: we get senescent cells with tissue injury, because they do seem to help in tissue repair. And, cell senescence may have evolved as an anti-cancer mechanism, where when cells develop these toxicities, that instead of being converted into a cancer cell, there are these growth-arrest genes that are activated that basically shut of the pathway to cancer, but the alternate pathway is cell senescence, but then they make all these bad cytokines that cause aging or cause tissue dysfunction. So, I think we have to be careful how we interfere with that mechanism. The approach that we’re proposing is not to keep senescent cells from forming, but by giving the senolytic drugs very intermittently, maybe just once a month, all you’re doing is reducing the burden of these senescent cells. EN: And finally, what do you want the audience members to take away from your ENDO talk? SK: That we need to broaden our focus when thinking about age-related co-morbidities (i.e, osteoporosis, frailty, diabetes, cardiovascular disease, dementia, renal failure, etc.) and instead of targeting each disease separately, consider approaches that target fundamental aging mechanisms – senescence is just one of nine key aging mechanisms (genomic instability, telomere attrition, epigenetic alterations, loss of proteostasis, deregulated nutrient sensing, mitochondrial dysfunction, cellular senescence, stem cell exhaustion, and altered intercellular communication) – to perhaps simultaneously treat multiple age-related co-morbidities. They’re all kind of interconnected, but by targeting, whether it’s senescence or any of these other pathways, if that becomes a significant success, technically you could actually reduce some of these pathways of aging. Then it’s very possible that with one drug, or a small number of drugs, you can prevent bone loss, reduce the risk of diabetes, heart disease, dementia — a whole host of aging diseases. So, in a perfect world, that would be the outcome, that you have intermittent administration of a small number of medications with minimal side effects that reduce your risk for all of these things that we are going to get as we get older. It’s very exciting, being involved in this research. -Bagley is the senior editor of Endocrine News. He wrote about the use of journey board for pediatric diabetic patients in the November 2018 issue.